This pretty mermaid shadow box was created using etchall etching cream, and is sponsored by etchall. If you dream of sandy beaches and the ocean waves, you’ll love diving into this fun project I created for etchall. 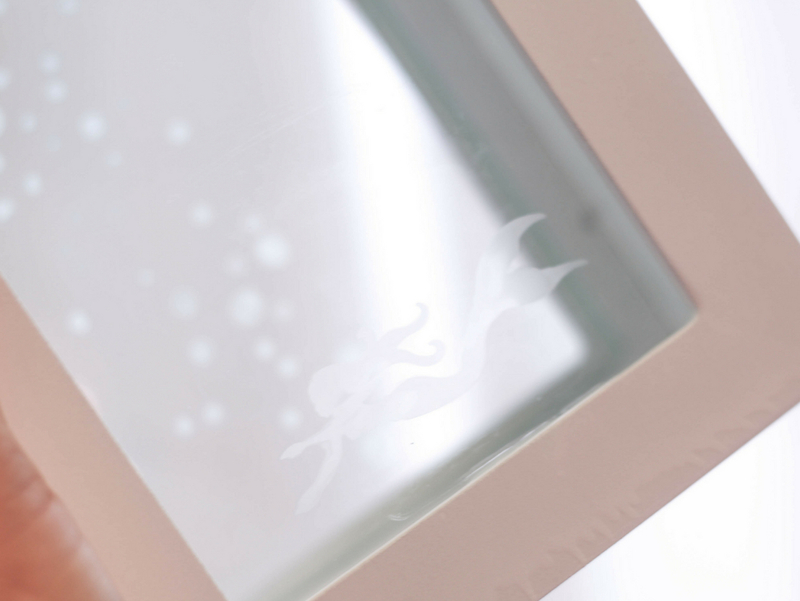 A mesmerizing mermaid is etched onto the front of the shadowbox, and the back is etched with tiny bubbles. 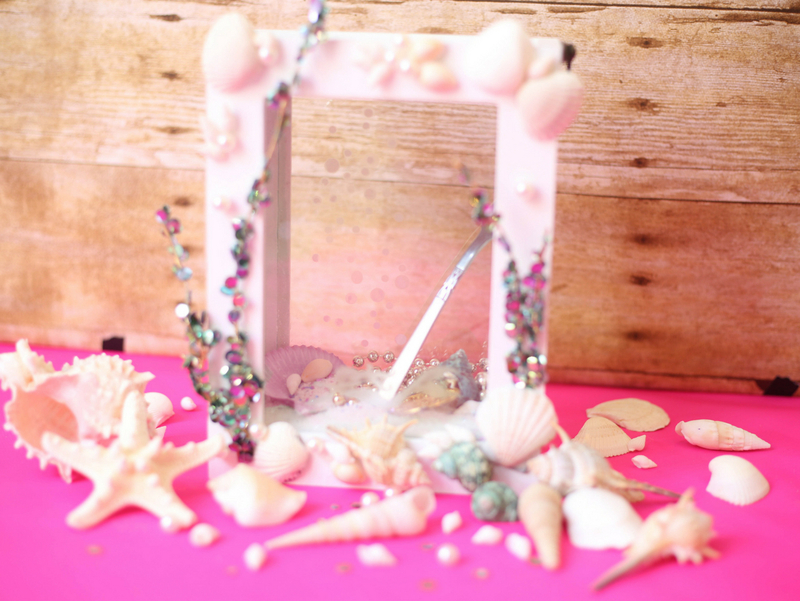 Fill this pretty trinket display with white sand, seashells, whatever strikes your fancy! The simple step by step instructions are provided for you. 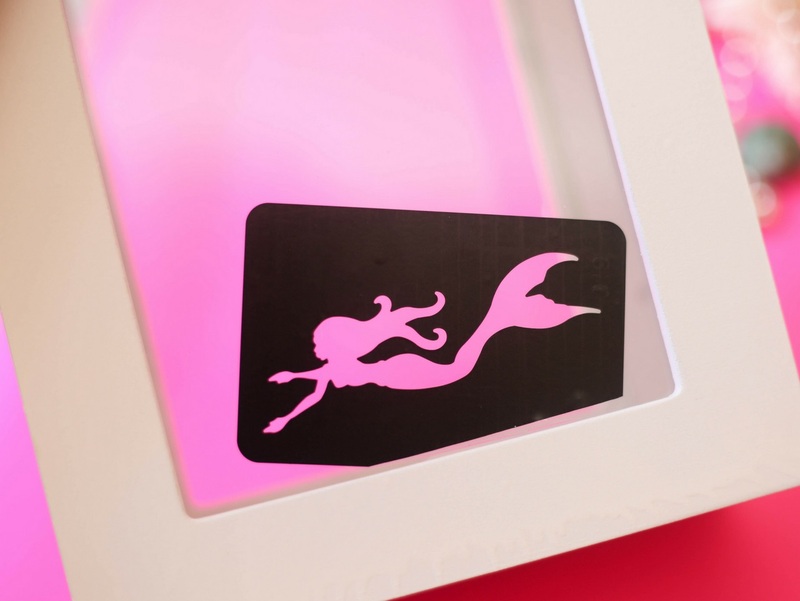 Apply the mermaid stencil to the front of the shadowbox. I considered positioning this a bit higher, but wanted to possibly add a small photo to the box, so I decided to alighn it with the bottom. Do whatever feels right to you! I trimmed the bubbles from the stencil and sprayed the back with etchall Stencil Spray. This is an awesome spray adhesive that gives your stencils enough “tack” to stick to glass for etching. 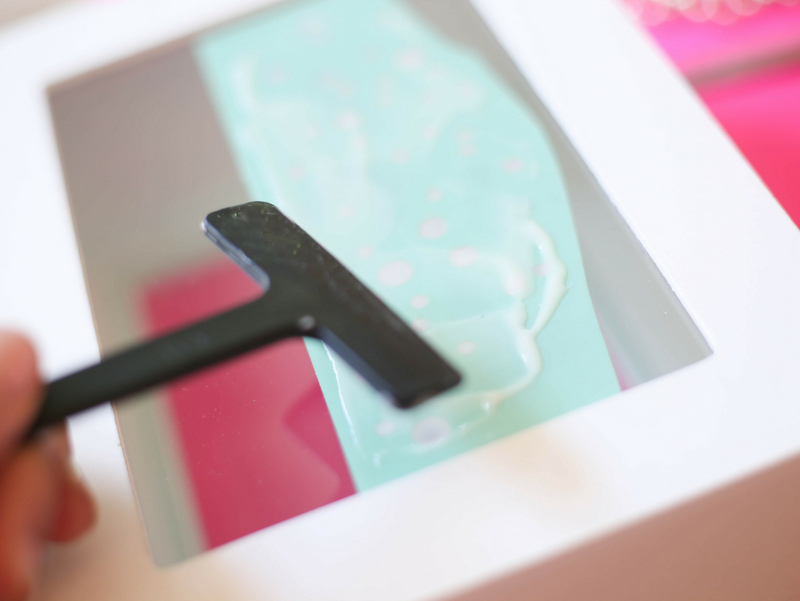 Be sure to use the etchall Squeegee tool to really ensure solid adhesion to the glass surface being etched. This helps avoid any of the etching cream seeping under the stencil. Apply the stencil to the back of the shadowbox, and apply etching cream as shown. Use the etchall Squeegee tool to spread the cream around all open areas of the stencil, but not beyond the edges. The etching process begins right away; set a timer for fifteen minutes. Apply etching cream to the mermaid as well. Once the fifteen minutes has passed, remove the stencils carefully and wash away the etching cream. For an item like this, that cannot be fully submerged, I prepared a small series of damp paper towels, and used them to wipe the surface of the glass, moving to the next to ensure no etching cream remained on the surface. The finished piece is coming along nicely! 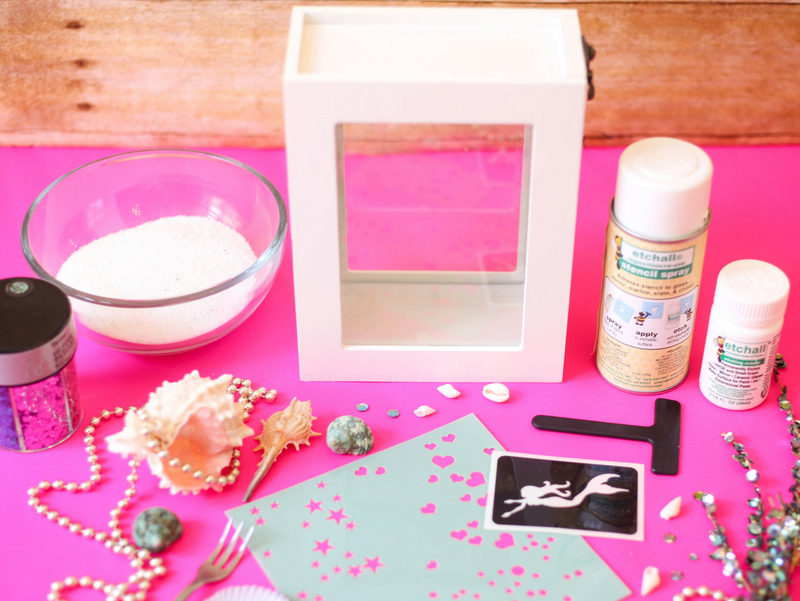 Fill the shadowbox with white sand, and if you like, glitter! (I always think a little glitter is in order, so I added several “mermaid-y” colors to my sand. I also tossed in a few seashells, a gold coin and some pearls. To top it all off, a silver cocktail fork is a subtle nod to the film, The Little Mermaid, specifically; Ariel’s “dinglehopper”. My eight year old daughter appreciated this special touch! 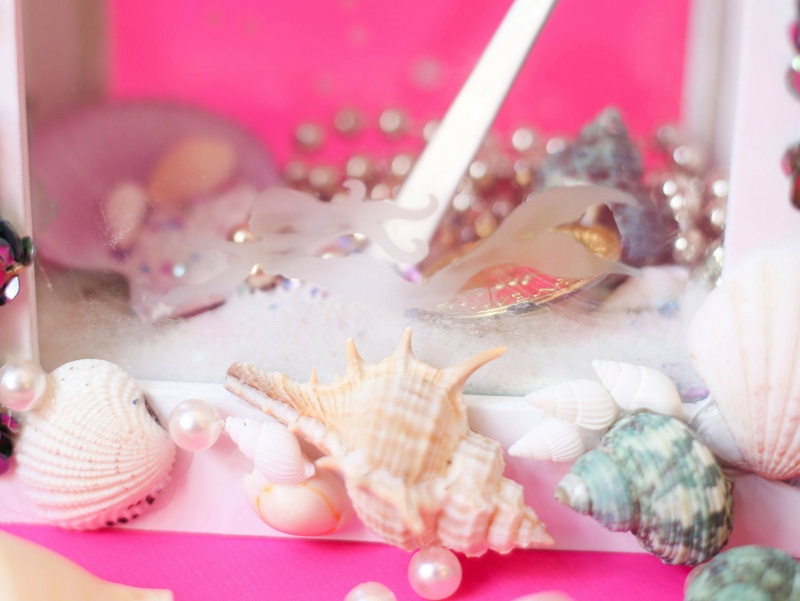 Glue seashells, pearls and any mermaid inspired embellishments that you can find to the outside edges of the shadowbox. This is also a great place to personalize the piece for gift giving. I just love how this turned out, and thanks to etchall it was so simple to make!